Really, when those two were ejected it hurt any kind of a comeback as they were our two best playermakers. I hated they were ejected, but I could definitely understand their frustrations. Landry was ejected on his final snap as a Dolphin. He got kicked out of the Bills game for starting an ugly fight, and that behavior seems to have contributed to the Dolphins’ decision to trade him to Cleveland. Always love me some Drake for coming out of that scrum with a Bills helmet and tossing it. And the crowd going wild. Ya hate the penalty and the ejection. But, that is going to be fun looking back on his career down the road. From a fans' persepective, I loved it. They were both mugged down there and the referees didn't call it. 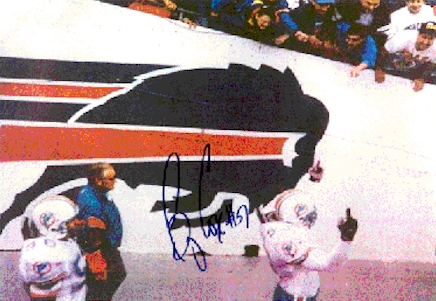 Which Dolphins fan didn't love Bryan Cox for flipping off the Bills fans ... right in front of The Don? It ranks as one of my top 10 favorite moments. Bring back the REAL rivalry! Cox brought the Dolphins plenty of unwanted attention by raising his middle finger on both hands, offering a double-barrel salute to Bills fans, as he walked on the field for warm-ups before Miami’s 22-13 win early in the 1993 season. Cox was fined $10,000 for that incident, which led to a lawsuit by Cox against the NFL. Cox sued the league and won, saying it did a poor job of creating a healthy work environment because security measures were inadequate. Cox had another incident late in a 23-20 Dolphins loss, on Dec. 17, 1995, a game that was Shula’s final regular-season defeat. Cox and Bills fullback Carwell Gardner were ejected for fighting and nearly came to blows again in the tunnel between the locker-rooms. Cox, booed lustily by fans, responded by spitting on the field in the direction of the fans five times. The league hit Cox with a $17,500 fine – the NFL’s largest that season. The play-by-play announcer said something along the lines of “Bryan Cox letting the Buffalo fans know that Miami’s 1–1 coming into today’s game,” which was magnificent. Simply put, if you’re going to jump into a rivalry with both feet, enjoy it as much as Bryan Cox did.